This eyeliner procedure is ideal for those who want definition to their eye area and prefer not to venture out without makeup. It is also useful for health care professionals whose jobs do not allow conventional makeup, i.e. theatre nurses, midwives. Semi permanent eyeliner is the ultimate solution for those with sensitive and watery eyes including Hay fever sufferers, and those with allergies to conventional makeup. It is ideal for keen sports enthusiasts especially swimmers, and also for those with poor vision or unsteady hands. You can choose between thin to medium eyeliner, but for a thicker fuller liner you may require more sessions. This procedure is similar to the brow procedure. We begin with the consultation to discuss the look you want and offer a patch test to check for any allergies to the pigment or anaesthetic. At the treatment stage we will take pre- procedure photos. There is no need to draw the liner on beforehand as we do with permanent brows. The anaesthetic is then applied to ensure maximum comfort. This can cause some watering from the eyes and blurred vision, but this is only temporary and normal vision returns within a very short time. Eyes can be kept closed throughout the procedure and can therefore be a little light sensitive immediately after the procedure due to the eyes being closed for a while. You may wish to bring some sunglasses along to wear afterwards or on the journey home. If you do have any light sensitivity is should be very short lasting. After making you comfortable in the Walnut’s Studio we begin the procedure. As we implant the pigment, it may cause your eyes to water, this is normal and varies from person to person. 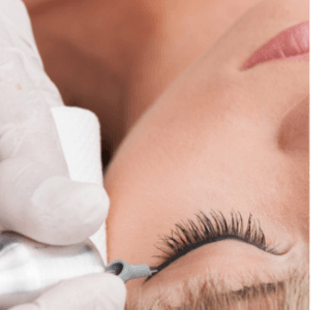 Many clients are apprehensive about this procedure beforehand as it is very close to the eyes, however, this is a completely normal reaction, but once we are underway with the treatment, most clients find the liner procedure absolutely fine. Despite any pre- procedure apprehension, clients are usually very glad they decided to go ahead and have been pleasantly surprised at the difference it makes to defining the eye area. Eyeliner gives a subtle natural definition to the eye area, but if you are looking for a thicker more defined liner, this can be successfully achieved but will require more than just 2 visits, as the liner has to be built up gradually layer by layer, so the treatment will take longer than if a fine to medium liner is required. The skin around the eye area can be very delicate and sensitive. You may experience some swelling, redness and eyes feeling quite tender and bruised immediately after treatment, similar to how it would feel after you have been crying. Again this is completely normal and you will have iced pads applied to the eye area after the procedure which helps to reduce any redness and swelling and soothes the eye area. It helps if you can continue to do this at home for the first day or so. You will be given an after care pack with post-procedure instructions and some aftercare balm. Your treatment will not be complete at this stage until after your 6 week follow up visit or longer if you are requiring thicker and more defined liner. All semi permanent makeup procedures are completed in two sessions. It is a two-part procedure & is not complete until you have had your 6 week top up. The uptake of pigment into the skin varies from person to person, depending on individual skin type. It is difficult to calculate this until after the first session when we can see how the pigment heals into the skin. The areas where the pigment has been rejected by the skin will appear ‘patchy’, but this can be corrected at the follow up visit and the colour evened out. Any adjustments can be made at this stage to the colour by going lighter or darker, cooler or warmer. Also with eyebrows any adjustment to shape can also be made. It is essential to return for the follow up eyeliner procedure, if you wish to complete your treatment and to achieve your top up visit should be no earlier than 6 weeks & no later than 12 weeks to achieve the best possible results for your Semi Permanent Makeup. Please remember that your aftercare instructions must be adhered to if you wish your Permanent Makeup to last and stay looking its best for as long as possible. Permanent eyeliner is not complete until you are due for a colour boost approximately between 12-18 months, which I would recommend to keep your permanent makeup looking perfect.